Need to insure a Crane? Give us a call and save ££ today! One Sure Insurance has sourced Special Types policies for clients who are looking to insure Cranes. Whether you're looking to insure a crane for use on private land, or for use on the public roads, we have underwriters who thrive on taking unique and perculiar risks such as this. We welcome all clients to give us a call and see if we can beat any of your previous quotes through our Crane Insurance scheme. As a broker, we have access to schemes that are not available to the general public or businesses. These schemes often provide extremely competitive quotations for vehicles such as cranes - and we can often work directly with our underwriters to secure discounts where possible. We are able to cover a varied amount of industries - including some high risk industries where other insurers may not be able to cover. We are often able to work as a middleman between our clients and our underwriters to put together bespoke and tailor made policies. We are able to secure rates on the most common types of insurance policies, such as Third Party, Third Party, Fire & Theft, and Comprehensive cover. We often advise that our clients opt for Comprehensive cover to ensure that the vehicle is covered in the case of accidental damage - although we can provide impartial advice and guidance as part of our sales service. We can also source and put together liability policies - such as employers liability, and public liability policies to ensure that you are covered for whatever life may throw at you. If you're ready to obtain an insurance quote for your crane, please free free to contact us on 0800 081 6053 or 0333 111 1337 (mobile friendly). 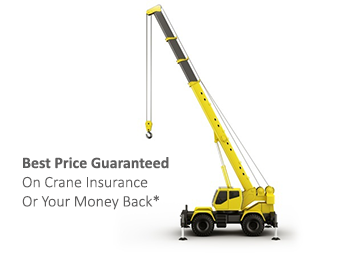 You can also obtain an affordable crane insurance quote via our special types online quote form.